With these two symphonies Herman D. Koppel liberated himself from the heritage of Carl Nielsen, who had been his teacher and his idol both as a composer and as a human being. During the German occupation of Denmark in World War II, the Jewish Herman D. Koppel and his family had to flee to Sweden, where they met a childhood friend of Koppel who had become a baroness. In her house Koppel could compose in peace and quiet. He dedicated his Third Symphony to her, but in spite of the safe surroundings, Koppel's experience of the war, and of the execution of his Polish-Jewish family in German concentration camps, had a profound impact on his works from this period. The Aalborg Symphony Orchestra and conductor Moshe Atzmon have won international acclaim for Vols. 1 and 2 in this series, and Dacapo Records is proud to present them in another great performance of one of the most important Danish composers of the twentieth century. Allegro moderato - Presto - Tempo I - Allegro energico - Tranquillo - Poco fluendo 29:24 22,40 kr. I Andante 16:00 16,00 kr. II Intermezzo scherzando. Molto allegro 5:53 9,60 kr. III Andante recitando - Allegro 13:02 12,80 kr. Herman D. Koppel (1908-1998) was one of the greatest Danish musical personalities of the twentieth century. Hard-working as a composer, pianist and teacher, and patriarch of a music dynasty that has become a Danish counterpart of the Bach family in Germany. In Denmark the name of Koppel is synonymous with musicianship of high standards through three generations and a wealth of genres. The Koppel family put down roots in Denmark in 1907 when Herman D. Koppel’s parents, a Jewish couple, moved from the Polish village of Blaszki to Copenhagen. This was an age of migration, when one in ten Danes emigrated, while at the same time the country received new blood from abroad, including thousands of poor Eastern European Jews. Herman D. (D for David) Koppel was the eldest son, and the family acquired a piano even before he was born so that the first-born could become a pianist. Herman began playing at the age of five. At seventeen he was admitted to the Royal Danish Academy of Music in Copenhagen, passing an admission test where the Danish national composer Carl Nielsen was on the assessment committee. From 1929 on Koppel had closer relations with Carl Nielsen, among other things playing all Nielsen’s piano works for the composer. In return Nielsen looked through a number of Koppel’s early compositions, and for Koppel Carl Nielsen became an ideal, in both artistic and human terms. Koppel was the last major Danish composer to take his point of departure in direct contact with Carl Nielsen. Koppel made his debut as a pianist in 1930, and the same year he had one of his works played in public for the first time. Apart from instrumentation theory, he remained self-taught as a composer. After the death of Carl Nielsen in 1931 Koppel became increasingly preoccupied with modernism from abroad – Stravinsky and Bartók in particular – and not least with jazz. Koppel became part of the ‘cultural radical’ environment of the inter-war years in Denmark that included composers like Finn Høffding (1899-1998), Jørgen Bentzon (1897-1951) and Knudåge Riisager (1897-1974). In the 1930s Koppel worked with genres as different as pedagogical Gebrauchsmusik, revue and film music, and in many ways he distanced himself from the traditions. This included the Jewish ones (to the dismay of his parents he married a Danish Christian woman). He began making a living as an accompanist, for example for the famous Danish tenor Aksel Schiøtz, with whom he also made many recordings. Koppel’s career saw a dramatic interruption when he had to escape with his wife and two small children in 1943 to neutral Sweden, because the German army of occupation launched persecutions of the Jews in Denmark as elsewhere. The family lived in Sweden until the end of the war, but the exile was to leave deep marks on Koppel’s life and music. After the war Koppel began working with new genres. He had hitherto mostly written instrumental music, but he now composed quite a few vocal works – those to Old Testament texts are particularly telling. His position in Danish musical life was strengthened in the post-war years, both as a piano teacher at the Academy in Copenhagen (he was a professor there from 1955 until 1978), and as one of the country’s leading instrumentalists and a representative of the contemporary Danish music of the period, which was dominated by a moderate, neoclassical modernism. The highly active period after the war culminated in the first half of the 1960s, when Koppel wrote some of his largest works. Of these, the oratorio Moses (1964) and his Requiem (1966) both have roots in his wartime experiences. In the 1960s the Koppel family also made a strong impact with Herman’s two sons, Thomas and Anders, who enjoyed sensational success in the experimental rock group Savage Rose, his daughter Therese, who became a pianist, and his daughter Lone, who became the star soprano of the Royal Danish Opera. In the 1970s Herman D. Koppel’s music became more compact, and as a concert pianist too he renewed himself. All the way up to the 1990s he continued to expand his repertoire with works that are otherwise rarely heard, including Schoenberg’s Piano Concerto. His last compositions are from the mid-1990s, and as a pianist he gave concerts until two years before his death. Considering how widely known Herman D. Koppel and his whole family have been in Denmark for over half a century, his larger compositions have been relatively absent from public awareness. Only his Third Piano Concerto has been performed fairly regularly and has also been recorded. Such a striking work as the oratorio Moses lay for over thirty years before it was performed again a few years before Koppel’s death. A thumbnail sketch of Koppel as a composer could go as follows: rooted in the musikantisch tradition, freer in form and tonality, and wary of dogmas such as dodecaphony or serialism. Koppel’s music often has a strong rhythmic feel, and some people can hear a colouring from Jewish traditions in his works. Koppel as a symphonist is someone few people have a clear impression of, for none of his symphonies has been recorded before, nor has any of them been a regular feature of Danish concert hall programmes. 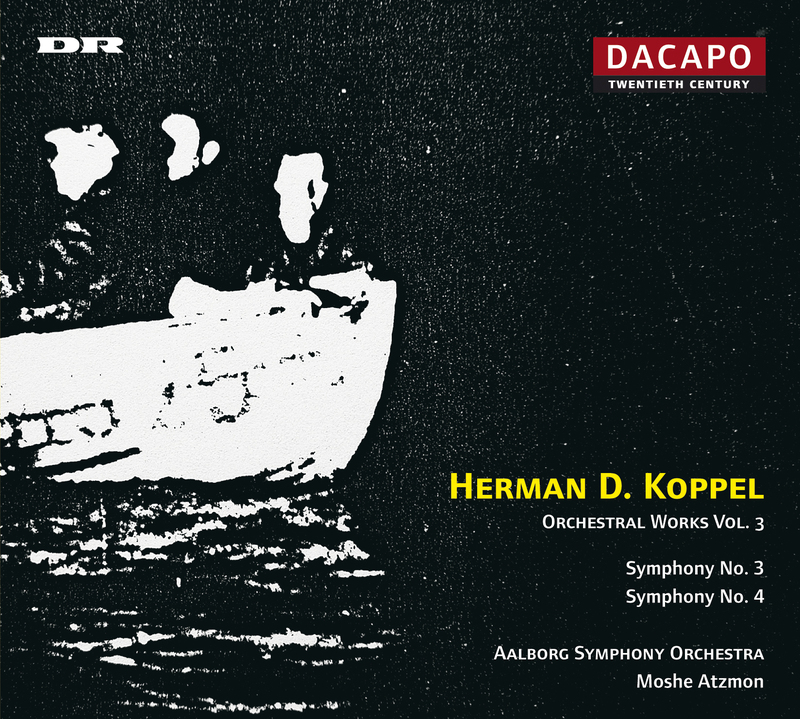 This series with first recordings of the seven symphonies gives us a clearer picture of one of the best known Danish musicians of the twentieth century, Her-man D. Koppel. Before the end of the war Koppel wrote his Third Symphony, which with its concentration and wealth of ideas surpassed both the preceding works. The symphony was written in exile in Sweden, in the years 1944-45. The family had to live on the various musical jobs that Koppel was able to get. Thanks to one of these, a radio appearance in Stockholm, Koppel made contact with an old acquaintance from his childhood years who was now married to a Swede, and had the title of baroness. Kop-pel spent many weeks with her family in the last winter of the war, and was able to practice there on a proper piano and to compose in peace. He dedicated the symphony to his hostess, Lea Åkerhielm. “For me this one-movement symphony expresses the fear mixed with horror we still felt about the fate of Denmark; not as a piece of programme music, but in mood and tone”, Koppel said in his old age. The structure of the symphony (which has some resemblances to Koppel’s other one-movement symphony, no. 6) is more rigorous than in the two preceding works; the orchestration is more precise, the counterpoint sparer and better exploited, while the overall tone recalls the Second Symphony. The symphony falls into three sections, but the overall development is determined by the metamorphoses of two subjects. The first of these is heard at the beginning, as a long, elaborated clarinet melody over a 6/8 ostinato in the violas. The second subject is an agonized melody introduced by the cor anglais in 9/8. The middle part of the symphony is dominated by a fiery accompanying figure that leads to a culmination in an oddly ‘inside-out’ full orchestration. After a last reappearance of the 9/8 accompaniment in the woodwinds comes the third main part of the symphony, introduced by the initial ostinato in the violas and bassoons, but now in 4/4. The second climax of the work is whipped up by unison strings until a full stop is achieved, and the symphony is slowly rounded off by an echo of the introduction. “Gusto” may be the wrong word to use of music of such longing as this symphony, but it is as if the limitations of the metamorphosis have strengthened Koppel’s thinking so that form and content match better than in the two preceding symphonies. The symphony shows that Koppel had developed an assured grasp of his musical material, and he was to maintain this skill in the subsequent decades. The Third Symphony was the first of Kop-pel’s symphonies to be printed, by the publisher Wil-helm Hansen, as early as 1946. After his return to Denmark, Koppel was quickly integrated into Danish musical life again, and the next 15-20 years constituted a central period in his career. Symphony no. 4 was written in June-August 1946. It was dedicated to Koppel’s former piano teacher Anders Rachlew and his wife Ada, who had been with Koppel among the Danish refugees in Sweden. The war was now over, but Koppel was still only at the beginning of a phase where his works were reflections on the war years. Thomas Jensen premiered the symphony on 7th November 1946 in a concert with the Danish National Radio Symphony Orchestra, and Koppel’s friend Gunnar Heerup gave a radio lecture on the work, for which Koppel himself played musical examples on the piano. The symphony was later only performed twice. The second subject of the movement is a pastoral hymn that is heard for the first time in the strings, but which is only able to make its mark with a single eight-bar progression before the rhythmic ostinato comes into play again. The rhythmic figure and the transforming solos are as if bound together in an irresolvable drama. Some resolution seems necessary, but the opposite happens. The rhythmic ostinati intensifies, while the main subject is assigned to the powerful trombones. After yet another brief occurrence of the peaceful second subject comes a contrasting development section in a more lively tempo. The rhythmic ostinato also takes hold here, and lashes the troubled waters up to the greatest climax of the movement, which approaches minimalism in its insistence. Abruptly, the second subject returns one last time, and the melodic first subject is allowed to float freely in the music, unaccompanied by the rhythmic ostinato. The short second movement is a clearly formed intermezzo scherzando. On top of the first movement the intermezzo evinces a grotesque, misplaced humour, virtuosically served up in Neoclassical form. Bartók’s late style must have been an inspiration for both the instrumentation and the form, but we can also find examples of satirical dance music as early as the miniatures from Koppel’s teenage years. Symphonic integrity is achieved in the last movement. A slow recitative in the violins presents short motifs that are used in the later allegro section. The recitative is tense, with high-pitched violin parts and irregular dotted rhythms in the accompaniment. A march tempo begins the main section of the movement, which quickly reaches a violently orchestrated climax. The middle section of the movement is kept at low dynamic levels, and is based on two new motifs which contrast with the subsequent recapitulation of the recitative motifs, now in the quick tempo of the main section. The effect is warlike and brutal, and is underscored by a new rhythmic ostinato, simpler than the one from the first movement. A brief epilogue, with thin, bright instrumentation compared with the struggles that are now over, concludes this, Koppel’s most complex symphony so far. The boldness of the Fourth Symphony must have been hard to swallow for the Danish audiences of the day, and the fact that it subsequently had so few performances helped to bias the general image of Koppel as a symphonist. The symphony is an ambitious work in which Koppel seeks out new limits for his music, and goes to emotional, contrapuntal and melodic extremes. One also experiences new heights for how tragically Koppel is able to write, and this is hard to interpret as anything but an expression of the destruction of war. Koppel was never very fond of interpreting his compositions programmatically, but by this time he had been living for about a year with the awareness that large parts of his mother’s family in Poland had been barbarously annihilated.